Obviously, this author just filed an official complaint with the Attorney General's office against the University of Houston over their stonewalling related to their football program. We will confess that we used this afternoon's TPPF/Texas Tribune event "Open Government, Engaged Citizens: A Conversation on Texas' Public Information Act," as a deadline to get the complaint filed. That's now happened. Texas' public information laws, while they look good on the surface, have more holes than Swiss cheese. One tactic that has recently gained in popularity is to launder governmental funds through shell "non-profits" or allegedly "private" entities. Austin's ongoing Amazon fiasco, the recent troubles with the Alamo, and a 2015 Texas Supreme Court decision related to the "Greater Houston Partnership" are recent examples of this phenomenon. 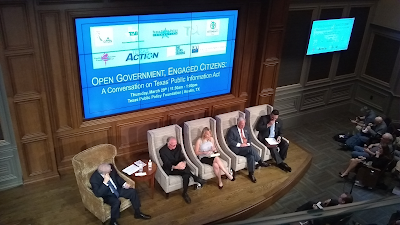 Senator Kirk Watson discussed several bills he carried this past session to close various loopholes in the Public Information Act. All of Watson's bills passed the Senate with overwhelming majorities. Unfortunately, they all died in the house [Note: What else is new?!?]. Todd Hunter gave a "woe is me" speech about how he totally supports Open Government, but it just got lost in the shuffle of a busy end-of-session period in the house. Of course, Hunter neglected the fact that he's the chair of the Calendars committee, which might give him leverage over a recalcitrant committee chairman. Hunter made a bunch of vague promises as it relates to transparency issues next session. That being said, Hunter did make an interesting point about many of the 'recovery' related contracts from Hurricane Harvey having major disclosure issues. James Quintero of TPPF spoke of the need for the Attorney General to have greater enforcement powers. He also explained the need to repeal certain provisions that have been interpreted to allow "economic development" discussions to occur in secret. He also discussed his frustrations trying to get information out of the City of Austin related to the Amazon 'negotiations,' a frustration we share.